Half the fun of our trips to Italy has been finding and enjoying good places to eat. Whether you choose a trattoria, osteria or ristorante for your next meal, a great way to choose a restaurant is just by reading the posted menu and peeking in the front window. We've found most of ours that way. We have rarely been disappointed. Asking the hotel staff, concierge or your self-catering apartment/villa owner is also a great way to find a restaurant with good food and Italian atmosphere. Some say to look for places that seem full of locals and places without photos of their food on the menu board. Many restaurants in cities like Florence, Rome and Venice exist because of the tourist trade, but if you choose to eat at a place with a tourist menu in English that is offering a complete meal with a glass of wine for 10 euros, you might not be disappointed. We have eaten at several "tourist restaurants" and found that the food and wine were more than adequate. Everything depends on your dining expectations and your budget. Several of our best dining experiences have occurred when we headed down a side street or alley and came upon the perfect little trattoria. Three restaurants that come to mind were all found a little outside the main tourist haunts, but still within walking distance of city centers. One we discovered on our second in Florence visit, when the four of us were starving after a long day of sight-seeing in Rome, so we headed out of our apartment on foot to find a place for dinner. We decided to try to stay in our neighborhood and were fortunate to find Il Cavaliere Ristorante on Viale Spartaco Lavagnini 20. This small, family owned restaurant exceeded our expectations with its delicious traditional Tuscan meals and excellent wine. I ordered Ravioli ricotta e spinaci (spinach and ricotta ravioli) and Debbie had Spaghetti alle vongole (spaghetti with clams). Both were delectable. What a delightful evening! 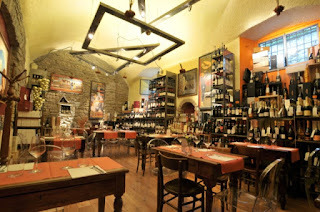 With a bottle of Vernaccia di San Gimignano, our dinner check was about 45 euros. On our most recent trip in November 2015, Debbie and I found two more excellent restaurants. Since we were having supper at our apartment some nights, we enjoyed seeking out little trattorias for lunch in each city we visited. Two favorites stand out: the first, Trattoria da Giampi e Ciccio at via Farini 31/B, was in Bologna, where we both had wonderful pasta meals and house wine for 34 euros. The second, in Bergamo (a city that we loved that wasn't even on our itinerary), we ventured down a side street after seeing a sign on the corner for Ristorante Lalimentari, via Tassis, 3a, Bergamo Alta. We were very pleased. The service, atmosphere, food and wine were excellent. Our total for lunch with wine was 44 euros. Be sure to ride the funicolare up to the old city to get to this restaurant.